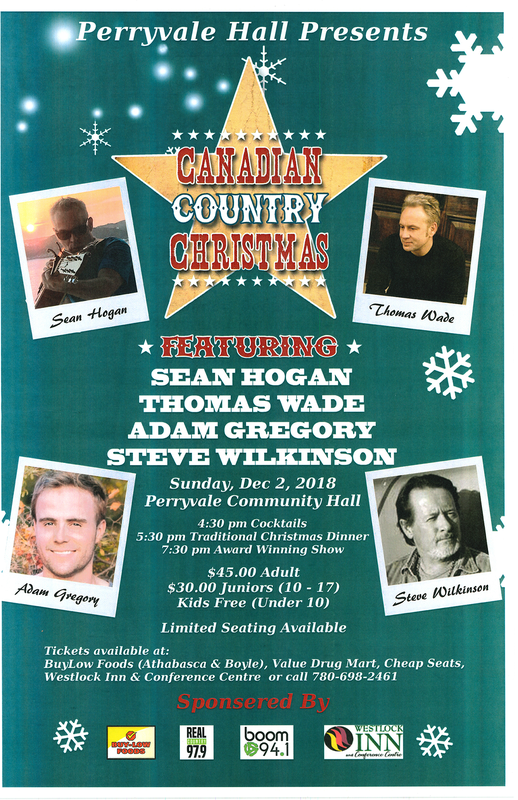 The Perryvale Community Hall will be hosting a concert featuring Sean Hogan, Thomas Wade, Adam Gregory and Steve Wilkinson the evening of Sunday, December 2, 2018. The evening starts with cocktails at 4:30 followed by a traditional Christmas dinner at 5:30 and concert at 7:30. Tickets are available at BuyLow Foods (Athabasca & Boyle), Value Drug Mart, Cheap Seats, Westlock Inn and Conference Centre, or by calling 780-698-2461.